The lightning fast shape and color recognition game that is sure to test the reflexes of kids, families and gamers alike. 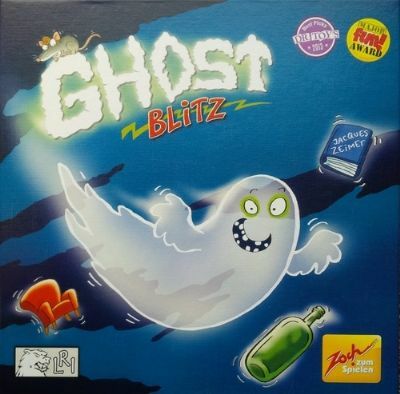 In Ghost Blitz, five wooden items sit on the table waiting to be caught: a white ghost, a green bottle, a cute grey mouse, a blue book, and a comfortable red chair. Each card in the deck shows pictures of two objects, with one or both objects colored the wrong way. With all players playing at the same time, someone reveals a card, then players grab for the *right* object – but which object is right?